. يعمل Bickley Valley Retreat على ضمان إقامة مريحة لضيوفه من خلال خدماته الممتازة وحسن ضيافته. يقدم الفندق فرصة للاستمتاع بشريحة واسعة من الخدمات بما فيها: واي فاي مجاني في جميع الغرف, صف السيارات . ادخل إلى واحدة من الغرف 1 وتخلص من عناء نهار طويل بمساعدة مجموعة كبيرة من الخدمات كمثل تلفزيون بشاشة مسطحة, اتصال لاسلكي بالإنترنت, اتصال لاسلكي بشبكة الإنترنت (مجاني), غرف لغير المدخنين, مكيف هواء الموجودة في بعض الغرف. صممت خدمات الاستجمام في الفندق والتي تتضمن سبا, حديقة لمساعدتك على الاسترخاء والراحة. يحظى فندق Bickley Valley Retreat بموقع ممتاز وخدمات يصعب منافستها. Thank you for a lovely and comfortable escape. Such a beautiful setting to relax and unwind. Leslie and Peter made us very welcome. We particularly loved watching the native birds munching their breakfast outside our window, as we ate. Thanks for your generous hospitality. We had a relaxing time away. The B&B was close to Kalamunda and the wineries. The room was clean, cosy and had everything we needed. The spa was lovely to relax in and we felt we had our own private space. We enjoyed watching the galahs and other wildlife whilst eating breakfast. We were fortunate that no one else was staying at the time so we had the lounge/breakfast area to ourselves. A wonderful stay in the peaceful Bickley Valley. Highly recommended. Beautiful place with great service! We spent just a day and love it! Quite.. private, lovely... wish to come back! We really enjoyed our stay they usually cater for weekends but we stayed for 2 weeks, the amenities were really good Lesley and her husband could not do enough for us, the breakfasts were excellent. The place was very clean and tidy. I would recommend The Bickley vally retreat to everyone can't big it up enough. 5 stars, more if possible. The staff were very accommodating, beautifully located, the Spa suite was perfect. Thank you for such an enjoyable, relaxing retreat away. The BEST, wish we could of stayed there longer, have already booked to go back again. Simply lovely. We were given the key and shown around then had the place to ourselves. Out in the bush, it was so quiet, lots of birds about, and how could you beat a spa under the stars. And breakfast in the morning was lovely and homely. A lovely stay. Exactly what we needed. Everything was perfect! Great location for a peaceful retreat in the hills - suggest a bit of soundproofing between the two guest rooms as was acutely aware of other guests. Otherwise very nice. 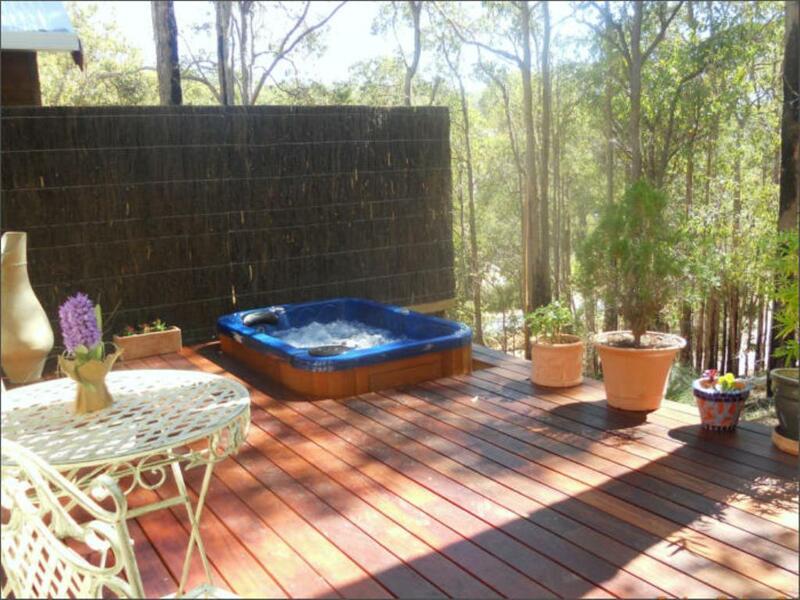 This was a perfect retreat not too far from Perth city, but still very secluded and relaxing. Leslie was a lovely and welcoming host, but still gave us plenty of privacy. The heated outdoor spa was definitely a highlight for us - we discovered that you can adjust the temperature on it as well. All the finishing touches, such as robes and complimentary wine and cheese platter just made the experience perfect for us. We will definitely be coming back here again! We were so surprised by the modern and comfortable room with a beautiful view. We enjoyed the peacefulness of nature. Great place for couples retreat! We discovered an excellent steakhouse just minutes away - The Blue Ox. Very comfortable, great breakfast and service. I would recommend to any couple for quick relaxing get-a-way at a decent price.